Telling both sides of the conflict from the view of reluctant soldiers, this collection does not hold back on the awful truth of war waged by those who do not understand its causes or reason. Soldiers die apparently from illness, war and mishaps and the senselessness of war is the main topic, told by the average grunt. Not an easy collection, it is important for those who were not around for the Vietnam War (and most other similar conflicts) to see what a waste of time, money, resources and, of course, humanity war can be. 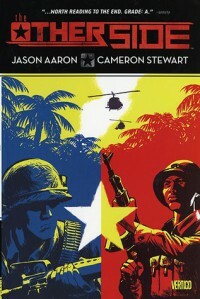 Reminiscent of Marvel's “The 'Nam” series.